The Samsung Galaxy S9 is here! Pre-order yours until March 11, 2018 here. Lazada will start delivering pre-ordered Samsung Galaxy S9 and S9+ units on March 12, 2018. So what are you waiting for? Happy shopping! Signing out for now. Peace! Are you ready to meet the entry-level smartphone king? 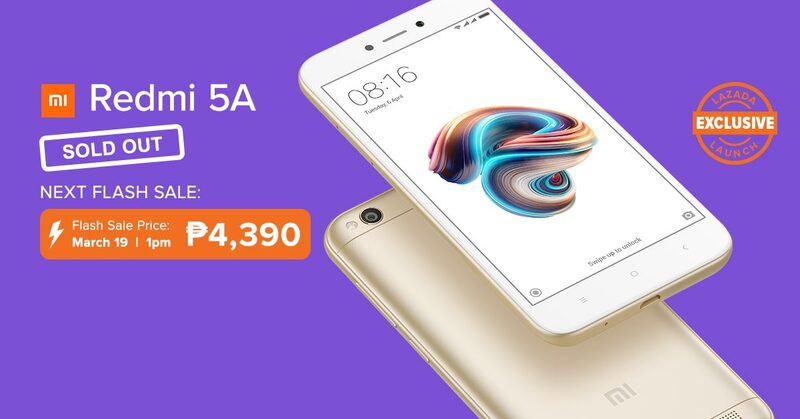 Xiaomi is officially launching in the Philippines exclusively on Lazada. Redmi 5A features Reading mode which protects vision and reduces eye fatigue by filtering out the blue light. Redmi 5A allows up to 8 days standby time. The large capacity 3000mAh battery with MIUI system-level power optimization offers up to 7 hours of video playback and 6 hours of gaming. How cool is that? Qualcomm’s Snapdragon 425 64-bit quad-core processor allows seamless daily use even while playing visually intensive games. Redmi 5A is dual SIM. It also has a microSD card for additional data storage. This entry-level smartphone king is preloaded with MIUI 9 allowing the phone to recognize your train ticket SMS messages and intelligently turns them into simple cards with all the important information on it. Redmi 5A comes with Mi Video that supports popular video formats and subtitles. It groups episodes by name and hides videos that you wish kept private. Transferring of files between devices is now made easier with Mi Drop without requiring an internet connection… similar to the Iphone’s AirDrop. For your convenience, Redmi 5A‘s comes with an App vault that remembers all your most used features and information such as call cabs, take notes, view upcoming events, etc. Take groupfies and scenic shots using the 13MP camera with PDAF. The price and date of sale are yet to be revealed by Lazada. We can expect though that the price that it will be offered to will be aligned to what Redmi 5A claims to be, and that is, THE ENTRY-LEVEL SMARTPHONE KING! You will then receive a notification containing the full details of the sale. Use my coupon codes below to avail of discounts when you purchase!